David Kirkland. 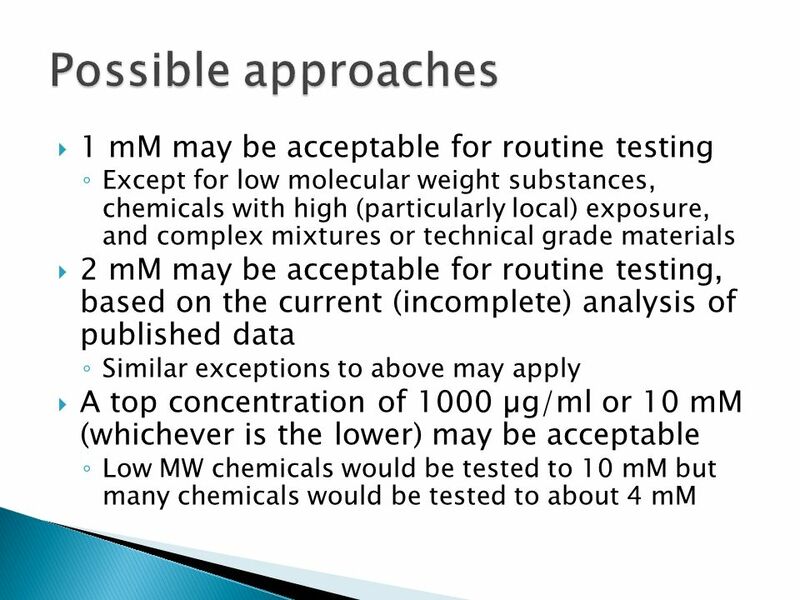 For non-pharmaceuticals the current data suggest it may not be necessary to test to 10 mM top concentration for non-toxic chemicals in. 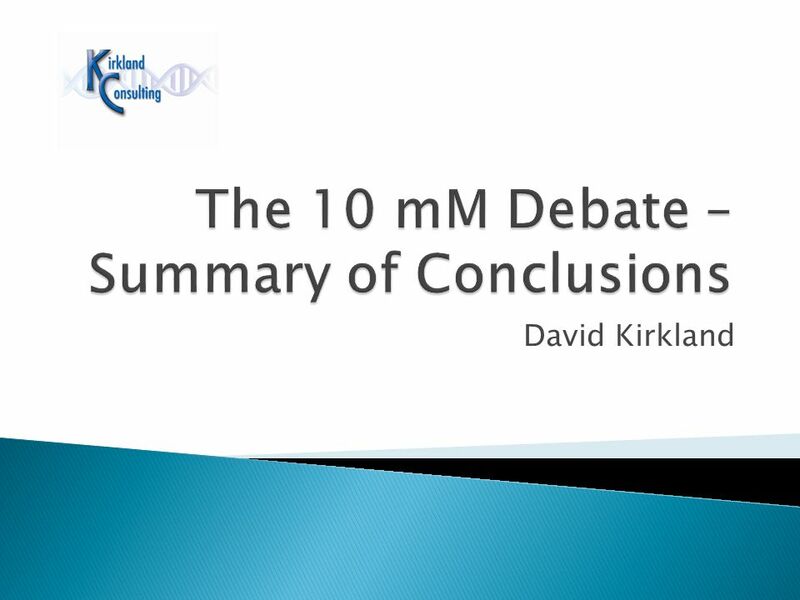 Download ppt "David Kirkland. 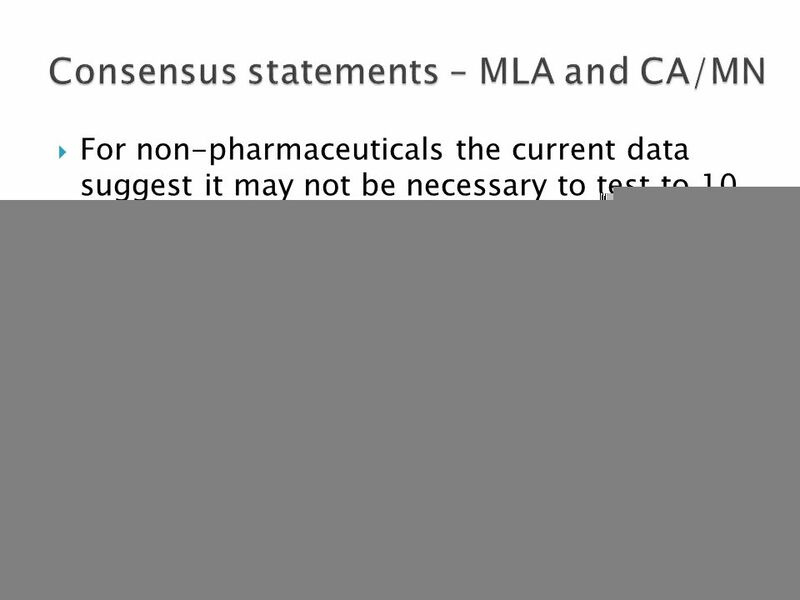 For non-pharmaceuticals the current data suggest it may not be necessary to test to 10 mM top concentration for non-toxic chemicals in." EH Terminology Presented by QBE Loss Control Services. IWGT Group 4 Improving in vivo genotoxicity testing- the link to standard toxicity testing Summary of discussion items, conclusions and recommendations. 1 5 TH INTERNATIONAL WORKSHOP ON GENOTOXICITY TESTING Basel, August 17-19, 2009 Group 1a Toxicity measures and top concentration for in vitro cytogenetics. Prof. David Kirkland Kirkland Consulting. 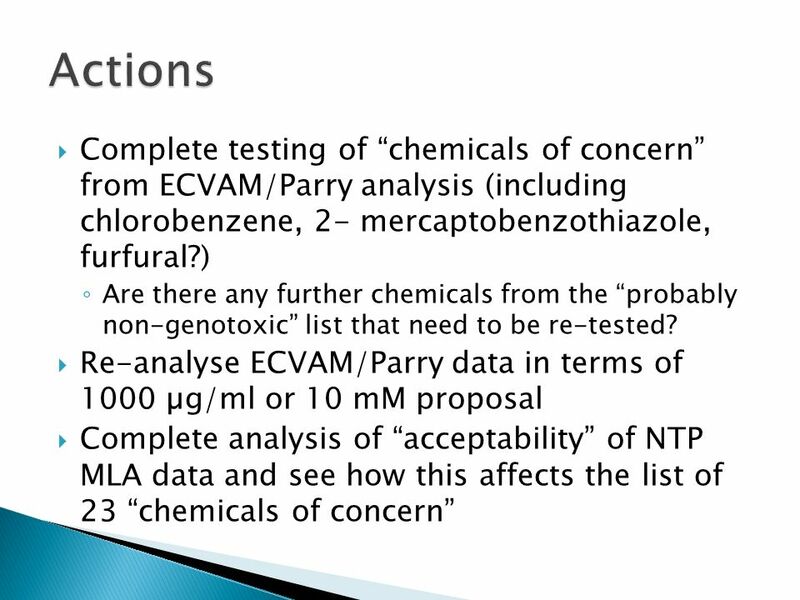 23 carcinogens (from 404 with genotox data, i.e. 5.7%) identified that are –ve or E in Ames, yet published data. Prof. David Kirkland Kirkland Consulting. For many, the frequency of misleading positive results in vitro is unacceptable Where follow-up testing in vivo. 1 Analysis of published data for top concentration of cytotoxicity testing in mammalian genotoxicity testing J. Parry, E. Parry, P. Phrakonkham, R. Corvi. Reaction Rates What affects the rate of reaction?. Air Pollution By: JW Option E. What is an Air pollutant? What are the Sources of Air pollution? What are the effects of Air pollution? What are. Statistical Evaluation of Dissolution for Specification Setting and Stability Studies Fasheng Li Associate Director, Pharmaceutical Statistics Worldwide. Britannia Mine: Environmental Impact Study of Treated Effluent Discharge Lee Nikl. Bioassay Investigations with Daphnia Developed by Kathy Cahill Wantagh High School Wantagh, New York.